For a generation who grew up with Cameron Crowe‘s 1989 directorial debut “Say Anything”…, the last decade-plus has been something of a disappointment. Watching Crowe morph from the guy who tapped into true emotions and resonant characters into a schmaltz machine has been one of the sadder directorial trajectories of my lifetime, but anyone who has paid close enough attention to Crowe’s films will hardly be surprised by this metamorphosis. One of Crowe’s most celebrated films, “Jerry Maguire”, plays like an emotionally honest script was run through the catchphrase factory before making its way to theaters. 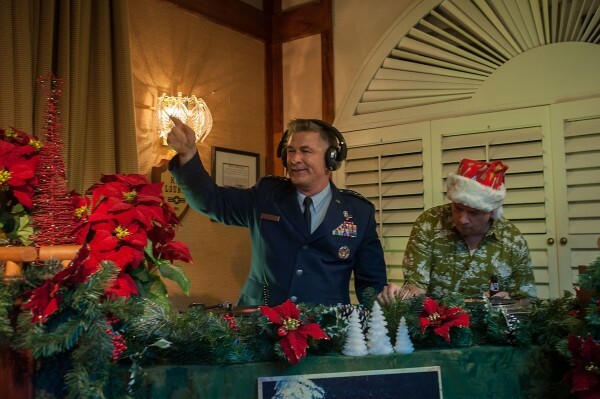 His latest film, “Aloha”, conclusively proves that the Crowe of old is gone and has been replaced by an impostor who understands what a Cameron Crowe film is supposed to look and feel like without an ounce of understanding the “whys” behind virtually every element of the film. 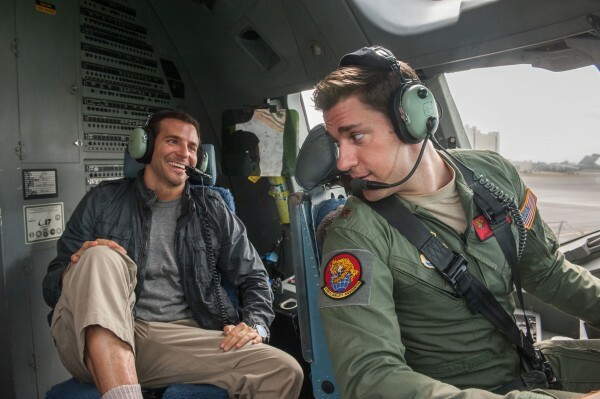 Bradley Cooper plays Brian Gilchrist, a military contractor who has come to Hawaii to set up some sort of dubious land deal for his billionaire boss, Carson Welch (Bill Murray). His ex-girlfriend, Tracy (Rachel McAdams), is now married to Woody (John Krasinski) and lives on the island with their two kids, the overly precocious Mitchell (Jaeden Lieberher, playing the exact same character he played in last year’s similarly treacly “St. Vincent“) and Grace (Danielle Rose Russell), the latter of whom is old enough to potentially be a byproduct of Tracy and Brian’s failed relationship. He is also set up with an Air Force handler named Allison Ng (Emma Stone) who, despite her name, looks 100% Swedish and 0% Chinese and Hawaiian, despite her proclamations that the balance is closer to 50/50. As the week wears on, Brian’s faith in his boss will come into question, as will Allison’s faith in the US Military, and everything else in between, and of course they’ll end up together because this is a Cameron Crowe film. The film is nothing if not predictable, and it takes every opportunity it can to hammer home those predictions the audience is sure to make within the first ten minutes of the film. It’s also a really bad sign that the film opens with a long-winded narration by Cooper’s character which disappears altogether once the film begins. Is this because Crowe failed to deliver exposition in any sort of practical way or was this a studio mandate? We’ll likely never know, unless there’s a two and a half hour version of this film sitting on Crowe’s shelf, which would also not surprise me. The film feels butchered and focus group-ed to death, and though I don’t think that there’s necessarily a “better” version of this story, this one is more than a little half-realized. It’s also deliciously ironic that a major subplot of the film revolves around the Americanization of Hawaii, of which many of the island’s natives are resentful, and then pushes the natives to the fringes of the film to focus on its almost exclusively white cast. Bumpy Kanahele, a well-known opponent of American intervention in Hawaii, even appears as himself, but his character has a friendly history with Cooper’s Brian as if to lend credence to the idea that the film is opposed to the very things it’s practicing. Showing how terrible it is that they’re marginalized is a noble endeavor, but the film similarly marginalizes them by placing its familiar white faces front and center after a single scene spent in their company. In fact, the film only succeeds as a treatise on the ultimate futility of their quest to reclaim Hawaiian independence without the help of white people sympathetic to their plight. One might be able to overlook all of these glaring oversights were the film compelling, but it isn’t. It wears its heart brazenly on its sleeve and should almost be given a break for how earnest it fancies itself to be, but the fact that it’s so openly manipulative at times even undermines its own attempts at sincerity. There’s a lot of talk about Hawaiian mysticism, all of which seems to be imploring the audience to overlook the film’s many, many faults and just go with the spirit of the film rather than its content. It seems almost remarkable to make such a statement, but this is the first Cameron Crowe film that felt like it should have been longer, if only to give the astounding growth demonstrated by all of the major characters some room to become at least marginally believable. Right now it plays like the kind of film where almost every single character has a major turnaround within the same five-day period, which is just downright absurd. The actors in the film aren’t doing anything they haven’t done better elsewhere, with the possible exception of John Krasinski. Cooper could play this kind of character in his sleep by now, and that’s not far removed from the state he seems to be in for most of the film. Stone is always a delight, but Crowe saddles her with a rather dubious heritage and cranks her quirkiness up to 11 almost as an illustration of her faults as an actor. Neither Murray nor Alec Baldwin can be depended upon to carry any more than the four or five scenes they have total, and the whole of McAdams’ performance consists of either smiling or shaking her head in disbelief, sometimes within the course of the same conversation. Again, I don’t blame much of this on them as they are all terrific actors, but I wonder how much of their participation in the film was based on the script and how much was based on Crowe’s reputation and the chance to shoot in Hawaii. I’m guessing probably 10/90. 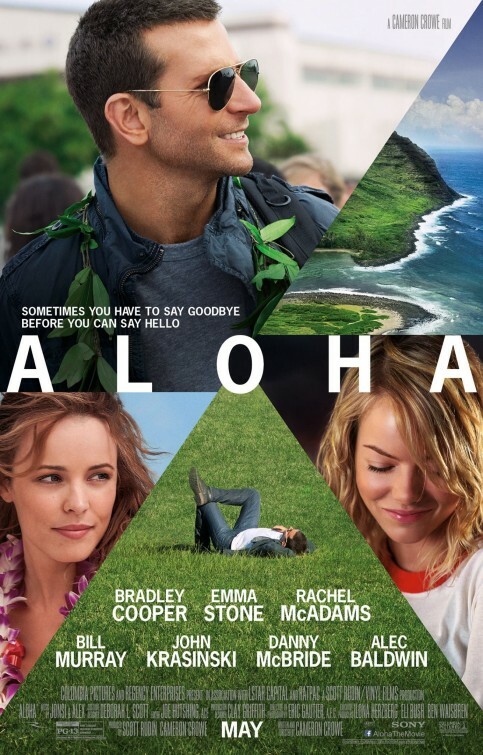 Nothing about “Aloha” feels genuine or organic, except the island of Hawaii itself. There are worse ways to spend an hour and forty-five minutes than by looking at truly beautiful scenery, but to have such trite, borderline melodramatic dialogue delivered against such an amazing backdrop is tantamount to a criminal act. None of this is to mention the fact that the film also has at least five different endings, giving “The Return of the King” a run for its money in the loose end tie-up department. “Aloha” is ultimately a really bad movie that manages to land a handful of emotional moments almost by virtue of the law of averages. Audiences, particularly adult audiences, deserve better than such boldly manipulative films as this, and hopefully this film’s failure to connect with them will force the filmmakers to reconsider their tactics. Much like this film’s main character, however, I remain cynical enough to know that they won’t, and likely never will.